. However, shoulder dislocations happen in a completely different location of the shoulder (where the shoulder meets the upper arm). Most shoulder separations are caused by trauma to the area. This can happen from a direct blow to the area, such as during contact sports like football or hockey. It can also be done from falling when your arm is outstretched, such as when falling off a horse or bicycle. The most common symptom of a shoulder separation is pain and swelling. Bruising in the area can also sometimes be found. Your doctor will typically be able to diagnose shoulder separation from hearing the story of how you were injured and by performing a physical examination. An x-ray may be used to ensure there is no fracture of these bones. If the diagnosis is unclear, an x-ray while holding a weight in your hand may be helpful. When this type of x-ray is performed, the force of the weight will accentuate any shoulder joint instability and better show the effects of the separated shoulder. As with any injury, your doctor will be the best source of advice on the appropriate treatment method for your situation. A shoulder separation can be a very painful injury, so the initial treatment is to decrease pain. This is best accomplished by immobilizing the arm in a sling, and placing an ice pack to the shoulder for 20-30 minutes every two hours as needed. Anti-inflammatory medications such as ibuprofen and aspirin may also be used to reduce pain and swelling. As the pain starts to subside, it is important to begin moving the fingers, wrist, and elbow, and eventually the shoulder in order to prevent a stiff or "frozen" shoulder. Instruction on when and how much to move the shoulder should be provided by your physician, physical therapist, or trainer. The length of time needed to regain full motion and function depends on the severity of the injury. A medical professional will examine your shoulder to determine the grade of your injury. Recovery from a Grade I AC separation usually takes ten to 14 days, whereas a Grade III may take six to eight weeks. When is Surgery Needed for AC Joint Separation? Grade I and II separations very rarely require surgery. Even Grade III injuries usually allow return to full activity with few restrictions. In some cases a painful lump may persist, necessitating partial clavicle excision in selected individuals such as high caliber throwing athletes. Surgery can be very successful in these cases, but as always, the benefits must be weighed against the potential risks. Speak with your doctor to determine the best course of action for your injury. The least damage is done, and the AC joint still lines up. 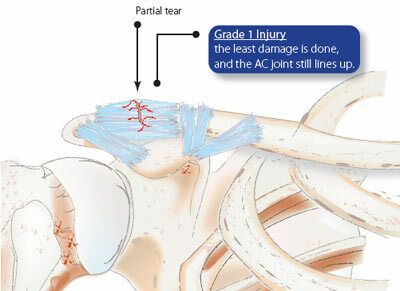 There is damage to the ligaments, which reinforce the AC joint. In a grade II injury these ligaments are only stretched but not entirely torn. When stressed, the AC joint becomes painful and unstable. 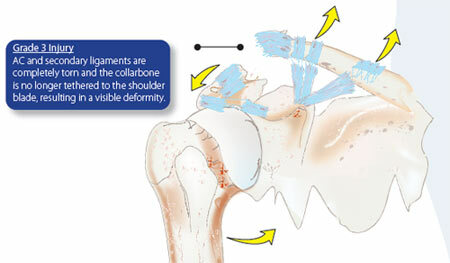 AC and secondary ligaments are completely torn and the collarbone is no longer tethered to the shoulder blade, resulting in a visible deformity.